So, what's been going on around the Geek's Quad? Here is a synopsis of some of the new additions and improvements around the property in the past few months. Our gardens grow larger each year and provide us with more and more, and with canning and dehydrating they help us towards our goal of self-reliance year-round. However, for a couple of years we have been debating which route we wanted to take to provide our own protein. We were considering raising chickens for eggs, but the more we researched it the more we read that it is difficult to get chickens to lay productively without buying special chicken feed that promotes egg production. Our end goal is to not need to buy food for the protein we choose to raise. 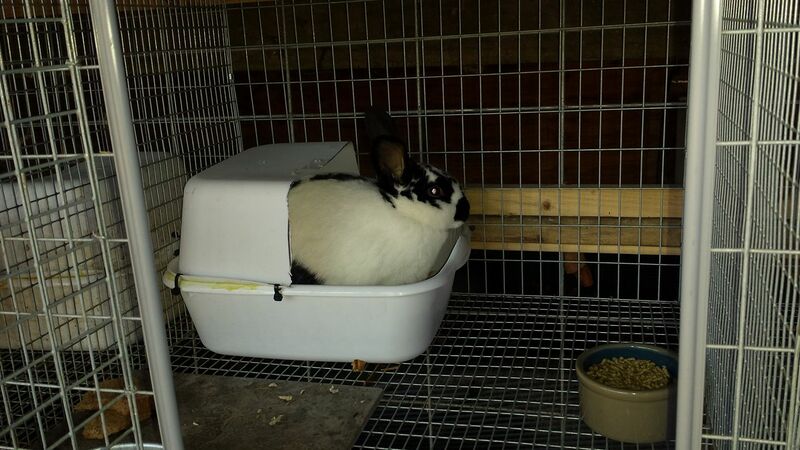 We had a couple friends who were raising rabbits. Both are feeding them store bought pellets to bring them up to 'meat weight' for butchering at about 8 weeks of age. 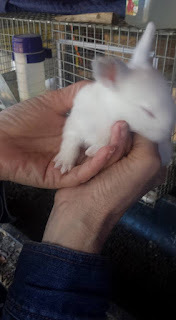 With more research I determined that raising and foraging our own rabbit feed seemed viable and well worth the experiment for our personal protein factory. Another plus is that rabbit production has a quick turn around time; and I had already butchered a bunch of chickens last year and figured I could handle rabbits. built their enclosure on the north side of our deck. This fall we got Roger, Jessica and Honey from a friend of ours. Yes, we named them because they are our producers (and part of the family) not the meals. 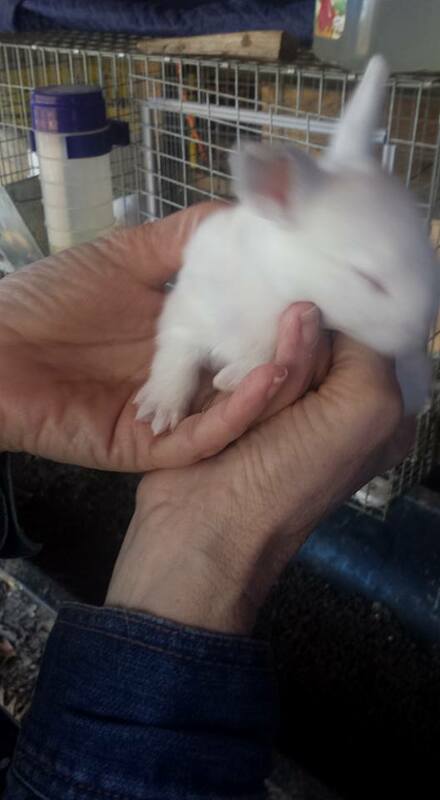 As I explained to my sister-in-law in a recent email, We call these ones our 'bunnies' and have named them, but all their young will just be 'the rabbits' as they will just be around for about eight weeks. We also have recently added Harvey to the gang. With one buck and two does we thought it would be a good idea to have a second buck. We are not too worried about the gene pool since none of the offspring are going to be bred, but we did want a 'back-up' buck just in case something would happen to Roger. A friend in our self-reliance group is living on a farm and caring for a lot of rabbits and asked if we would be interested in a buck she had available. He actually came with registration papers and a name (AG3), but he requested we change his name, thus Harvey. I think the girls are enamored with his 'bad-boy' appearance as he has a tattoo - his original name inside his ear. I am currently in the process of deciding what new produce I want to add to our gardens this year in order to feed the rabbits. This winter I have been feeding them various vegetables and herbs I have dehydrated and they seem to prefer some of these over the fresh produce. This year's garden will have several raised beds dedicated to fresh greens as well as produce that can be dehydrated and stored for winter feeding. them to friends if we have to go away, say for Turkey Palooza. cages to catch all the fertilizer the rabbits manufacture for us. If you are a regular reader of the blog, you know we name just about everything on the property and that our wood burner is named Reggie. Last summer, after quite a bit of research on Alan's part, we decided to buy a rocket stove for heating the house. We had been researching and discussing rocket mass heaters for some time, and Alan had discovered a rocket heater that he was quite interested in. Our plan was to experiment with it as a rocket heater 'as is' (no mass) as the videos on the web site show this unit being used in a similar manner as our wood burner. The main reason we were interested in switching to this type of heat source was because of the fuel source. Rather than burning logs, the rocket stove burns small branches and twigs; and our thinking is that as we get older it will be easier for us to gather our winter wood supply for it rather than cutting trees and splitting wood for the traditional wood burning stove. Another plus right now is that this particular unit has an additional accessory that is a hopper that will hold a 40 pound bag of wood pellets, the type burned in pellet stoves. Pellet stoves need electricity to feed the pellets, but the inventor of this stove created a totally gravity fed feed for their pellet hopper. 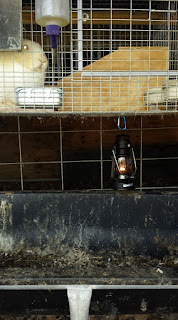 While bags of pellets are not self-sufficient, we do like the fact that on very cold nights we can put the pellet hopper in place and have an eight to ten hour burn without getting up every couple of hours to feed the wood stove. Neil, with his pellet hopper installed. We got the stove last summer and Alan installed it in September when I was up in Colorado visiting the grandkids. I came home to find Neil (the rocket man) installed where Reggie had been and Reggie had been moved to the other side of the living room until we found a place to store him. Alan had been experimenting with Neil and while he worked well, the results were not quite what we were hoping for. I won't go into a lot of details, I think I should have Alan write a more detailed blog in the future. At the time of this writing, we are still experimenting, we are still pleased with the purchase but we have also re-installed Reggie, the wood burner. Our living room and kitchen are one large open living area and we realized that rather than store Reggie away we could install him at the other end of the living room, near the kitchen. This has been a great solution. I love the ambiance of the fire that Reggie offers and Neil provides us with a very fast heat up when we come home to a cold house as well as a long burn time when we use pellets rather than 'scrap wood'. With Reggie now sitting between the kitchen and the living room, we had to rearrange the furniture a bit. We also now had a wood pile sitting more directly in the living room rather than off to the side where Reggie used to be located. I was determined that there had to be a solution to the constant clean up I was always doing around the wood stack. We have always had a couple rubber mats on the floor where we stacked about a days worth of wood next to the stove. I got the idea that we could put a galvanized stock tank next to the stove to hold the wood (and the mess). Alan was not sold on the idea, but he agreed to go to Tractor Supply and pick one up. If we decided it looked to 'clunky' we could always use it somewhere else on the property. We brought it home, set it next to Reggie and filled it up with wood. I loved it and it held almost three times as much wood as we usually brought in at one time. Alan still wasn't sure, but I posted it on Facebook and everyone agreed with me. So, he was officially named Tubby and is yet another inanimate member of the family. Last year I had a plethora (love that word!) of pollinators in the garden. 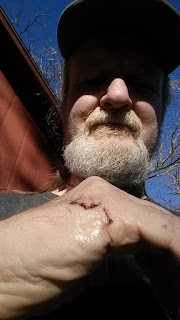 But with putting in the orchard this spring, hopefully (long story for another time) and the opportunity for another experimental project I began thinking about bees last fall. As my research brought me deeper into the world of beekeeping, I realized that while I wanted bees I did not want to become a beekeeper, or should I say what I was seeing a typical beekeeper to be. I had signed up for a three month long online class on bees and beekeeping. It has been very informative, but even those writing the course explain that beekeepers tend to be very opinionated and while there are multiple ways of doing things in the world of beekeeping, depending on who you talk to they will be adamant that their's is the only right way to do it. Along with that, I have come to the conclusion that, like many other hobbies, beekeepers often become obsessed with their hobby. As I was not getting into bees as a business, it was technically going to be a hobby. However, like many of our off-grid endeavors my goal was for this project to compliment our lifestyle, not to be an all consuming hobby. I started explaining it to people in our self-reliance group as 'I wanted to have bees but I did not want to become a beekeeper'. One thing our life style has taught me is that while we have a need for a lot of interests - gardening, canning, solar power, etc. we also have to have balance in all of them. And thus I started more research - okay, maybe research is where we lack balance! I wasn't interested in additional bee products - honeycomb, beeswax, etc. About this time the course I was taking got to the section on 'Types of Hives'. They covered the three main designs - Langstroth, Warre and Top Bar and then in passing mentioned a new design out of Australia called the Flow Hive. The course said they were providing an unbiased review of the Flow Hive, but after reading it, I called it a biased, unbiased review. 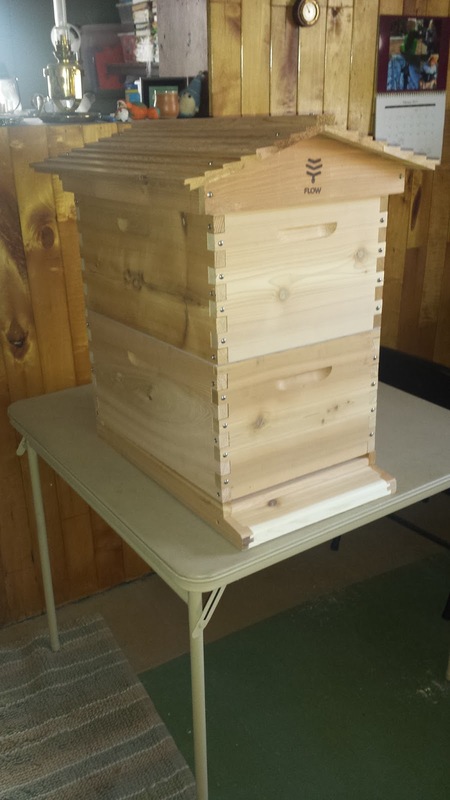 The main point of contention seems to be that real beekeepers do not considered the Flow Hive to be a true hive because it is not traditional. And, it is apparently causing a lot of hoopla in the world of beekeeping. built Clive for me while I was there! The Flow Hive was designed by a father and son in Australia who spent 10 years thinking out and refining their design. They then made it available through crowd sourcing (think KickStarter) and ended up raising a phenomenal amount of money due to the amount of interest in this new design. Basically, the frames in the hive where the honey is stored have pre-made combs. These combs have a unique mechanical design that allow you to drain the honey without removing the frames from the hive or even opening the hive. You still need to open your hive on other occasions, like routine hive inspections. 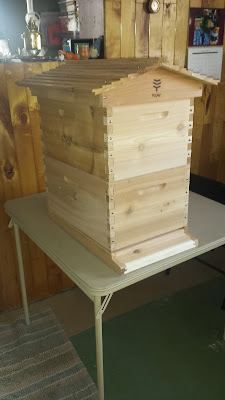 The brood box, which contains the queen and 'nursery' is a normal style Langstroth both with typical frames that sits below the box that contains the flow frames (called the 'Super'). So, except for the way in which the honey is drained from the hive, the care of the hive is the same as with traditional set-ups. Well, the more I researched it, the more I felt the Flow Hive would offer the type of bee experience I am looking for. So I placed my order and after a slight Fed Ex mishap, a box was damaged during shipping and returned mid-shipment for replacement, Clive (the hive) has arrived and is ready to be assembled. I have also ordered a nuc (nucleous colony) of bees from a local supplier and I should be able to pick them up in early May. That should be exciting! And now we circle back around to the rabbits. Between travel and bouts of below freezing weather we had a couple delays in when we planned on breeding our rabbits for the first time. We decided the first of the year would be a good time. So we bred Roger and Honey on January 2nd. And that did confirm for us that yes, Roger is a buck and Honey is a doe, sometimes it is hard to tell just by looking at them and when they were given to us we were told which ones they thought were the buck and the does and that they were fairly certain they were correct. Honey should kindle (have her babies) on February 2nd. As of a couple days ago I should be able to feel the kits (babies) inside of her when I palpate her abdomen. So far, I can't feel them, but we have been feeding the rabbits generously in the cold weather so Honey may just be a bit too plump to feel them. We'll be putting the nesting box in her cage in about another week. As an added note, it has been several weeks since I wrote this blog post, I procrastinated getting pictures. In the mean time Harvey has proven to truly be a bad-boy by biting Alan several times. He has since settled down, but we have decided to re-home him as the same friend that gave us Harvey has also given us an adorable black and white buck. The black and white pattern is known as a Charlie and thus he is now named Charlie. Honey kindled the first of February with seven kits and all are doing well. We have now bred Jessica to Harvey before we give him away. The kits were born on a 28 degree night. To survive, kits need to keep their internal temperature around 100 degrees. 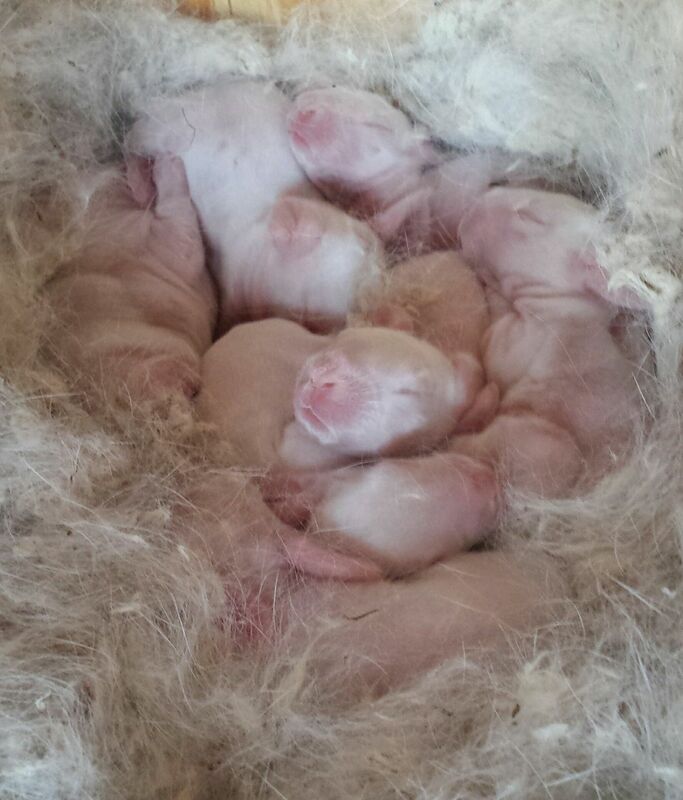 We learned that the mother rabbit does not snuggle her babies to help keep them warm. As her scent can attract predators, she stays away from her babies to protect them. She only nurses them just before dawn and again just after sunset. So the kits have to keep themselves warm. They can do this down to about 40 degrees. So below that we need to help them survive. Many ideas came to mind; warming lamps, heat stones, warming pads to name a few. The problem is that all of these are electric, and use large amounts of power that would be hard to supply being off-grid. Creating heat from electricity is one of the most inefficient uses of electricity. 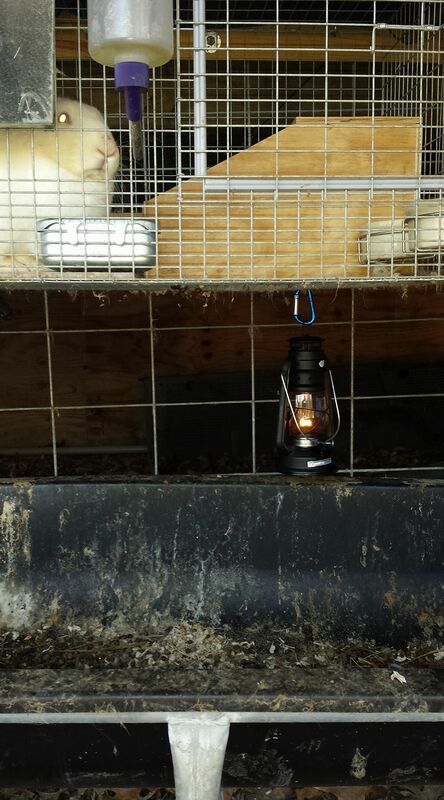 Then we came up with this idea: suspend a kerosene lantern under the nesting box. It uses just pennies of diesel fuel per night, and burns for over 24 hours on one filling. We also cover all the cages with movers blankets on nights that it will drop below freezing. I really need to get in the habit of carrying my phone or camera around to document our work days as lack of photos tends to be the main delay and/or restriction to the number of blogs I post lately. Earlier I said the rabbits that our bunnies produce will only be around for about eight weeks. Well, they will still be around after that but you will have to look in the pantry for them. So technically, we could give them all a name... as long as we name them all Stew.